In this picture, the woman is pointing the tube part of the Geiger counter at a can of chili with her left hand. The box has the battery and other electronics in it. She’s using the headphones to listen to the clicking sound which indicates a hit. Picture courtesy of Wikimedia Commons and the US Government. Geiger-Mueller tubes are the heart of “Geiger counters” which you’ve probably seen in movies or on TV- a character points a small device at a radioactive source, and it emits a static-like crackling sound, with more clicks indicating larger amounts of radiation. They work by having a pin inside of a metal tube, with the pin being at a high voltage (in this case 400V) and the outside of the tube grounded to 0V. A spark really, really wants to jump from the pin to the casing, but it can’t because there is a gas in between. However when a radioactive particle of some nature (depending on the gas) passes into the tube and collides with a gas molecule, it releases a cascade of charge carriers which cause a breakdown in the dielectric, allowing a spark to jump. This event can be seen on the outside of the tube as a sudden spike in voltage, and it’s through this mechanism that we can detect radioactive particles. By taking several of these tubes it is possible to tell which direction a particle has come from since it will pass through several tubes (or rather the cascade of junk, called muons, that explodes out from the initial collision will hit the subsequent tubes…to use the technical terms.). 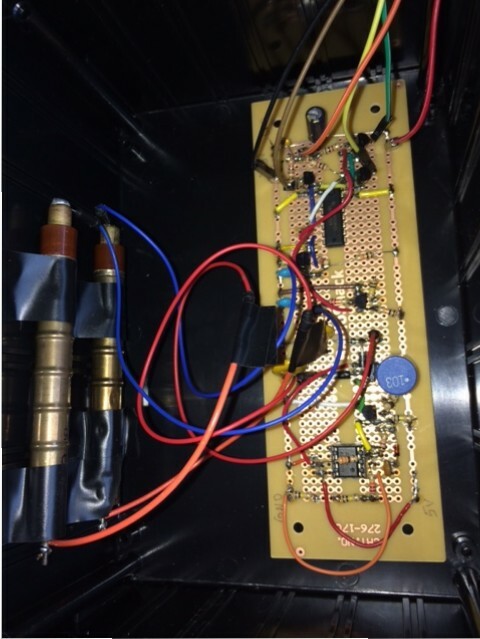 I assembled the device on several breadboards, and then condensed it to one solderable perf-board and taped it inside a RadioShack enclosure– which didn’t even have one of the four screw holes on the lid drilled through! I had to drill it out myself! 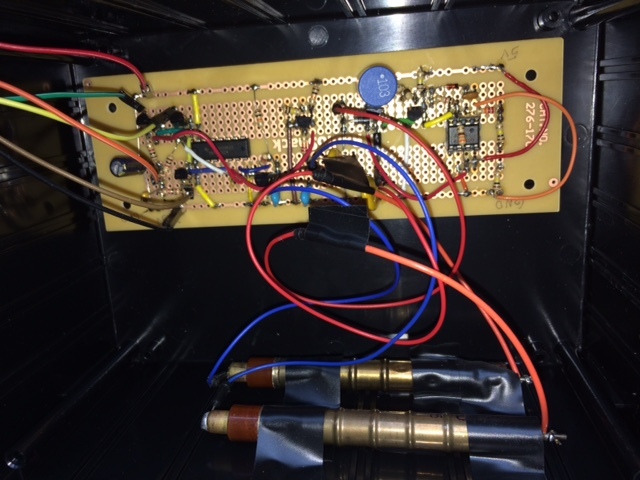 The geiger tubes on top of each other and the circuit board, all taped inside the enclosure and insulated with electrical tape. 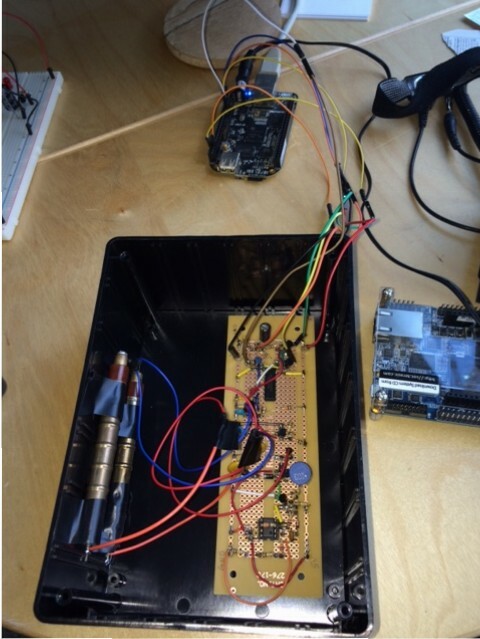 The full system hooked up to a Beaglebone Black which is busy powering it and detecting falling edges. 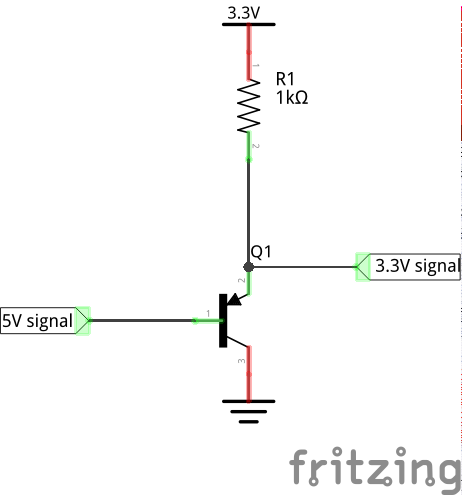 5V to 3.3V level shifting circuit, which handles active-low signals. I used a PNP BJT because the signals are active-low, so when the “5V signal” in the diagram goes low, it turns on the transistor, which brings the “3.3V signal” low as well. 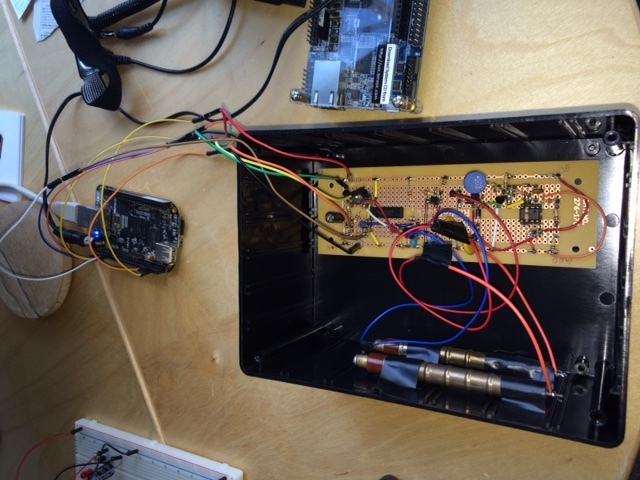 That means the software running on the Beaglebone (using Adafruit’s great BBIO library) has interrupts looking for falling edges on the three outputs: tube 1, tube 2, and the NOR gate that both tubes go in to which indicates a coincident hit. One problem I ran in to with this level shifting circuit was that I initially chose a 10k current limiting resistor, but the signals weren’t being picked up by the Beaglebone. When I examined it with a multimeter I realized the logic level wasn’t moving very far and it was much lower than I expected when off. It should have been close to 3.3V when the transistor is off, but was only around 2V. It turns out there are pulldown resistors on the GPIO pins inside the Beaglebone which can’t currently be disabled, so I had to lower the resistor to a 1k and that solved the problem. Using only a 1k means that the voltage at the emitter of the transistor (the side with the arrow) goes up much closer to 3.3V when off and still goes pretty low when it’s on, as desired. If you don’t know what a pulldown resistor is, imagine a resistor in parallel with the transistor in the above schematic between “3.3V signal” and ground. If you have some basic electrical engineering knowledge you can see that the resistor divider determines the “on” voltage at that node based on the values of R1 and R-pulldown. 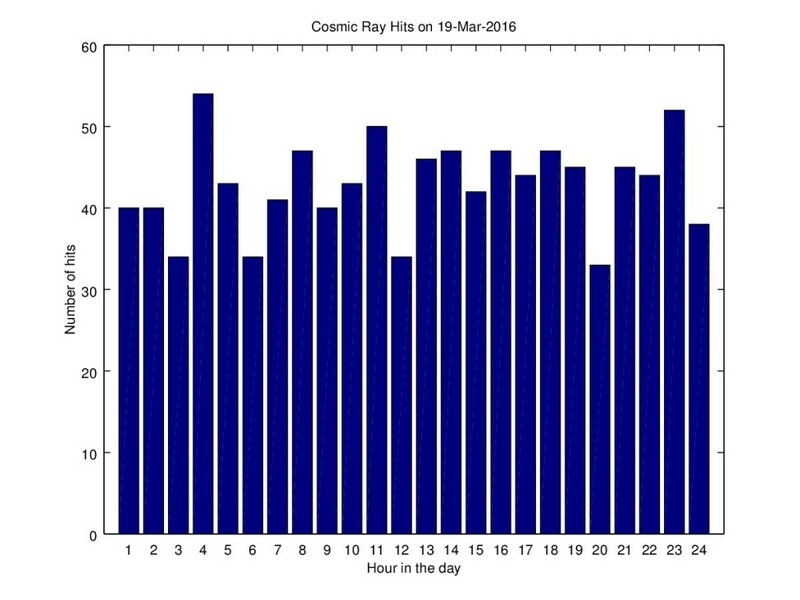 Cosmic ray hits per hour for March 19, 2016, in my living room.